Orbital debris meets operational satellite. The build-up of human-created orbital debris has reached a critical point. The buildup of space debris orbiting the Earth, which poses a threat to spacecraft and the environment, has reached a critical point, scientists say. The space junk trend no longer can be reversed by full compliance with mitigation measures now in place; it will get worse without more-aggressive action such as active debris removal, or ADR. And that just might pose the biggest engineering challenge of the 21st century, according to J.-C. Liou of the Orbital Debris Program Office at NASA's Johnson Space Center. "As the international community gradually reaches a consensus on the need for ADR, the focus will shift from environment modeling to completely different challenges: technology development, systems engineering, and operations," Liou explained in the July edition of NASA's Orbital Debris Quarterly News, issued by his office in Houston. Liou said that even if nations are in 100 percent compliance of all the measures now in effect to help curb space junk — guidelines more than a decade in the making — "it would not be enough. … We have reached that point. We need to take more aggressive measures." In the meantime, smashups between objects in space lead to fragmentation, constantly creating more debris. Consensus on active debris removal. Cooperation: the removal targets may belong to a different country. Collaboration: It is highly unlikely that any single organization or country can accomplish the goal by itself. Contributions: Cost-sharing will be the key for engaging in active debris removal. Liou said that five key questions must be addressed at the beginning of any ADR planning. They are: Where is the most critical region for ADR? What are the mission objectives? Which debris should be removed first? What are the benefits to the environment? How should the operations be carried out? To control the future increase in space debris or reduce the number of fragmentations, officials should focus removal operations on large rocket bodies or spacecraft — objects at least several meters long, Liou explained. And to reduce mission-ending threats to operational spacecraft, the focus should be on the 5-millimeter to 1-centimeter debris. "Targeting anything outside these two size regimes will not be an effective means to remediate the environment, nor to mitigate mission-ending risks to operational spacecraft," Liou concluded. This chart shows statistics relating to space junk circling the Earth. 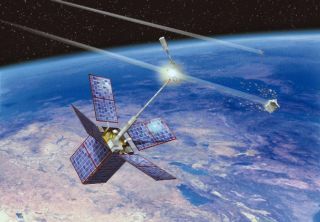 Over the years, a number of space debris removal ideas have been proposed, from space tethers, giant foam balls and laser beams to garbage scows and even huge fishing nets. But Liou said what’s needed is a first-things-first approach. "We need to be more specific about the question we want to address. You don't want to spend hundreds of millions or billions of dollars to just go up there and remove debris when you cannot quantify the benefits to the environment," Liou pointed out. "We need to take a very focused, efficient approach to address the key problems." Liou added that orbital debris-removal appraisals currently underscore two criteria: "It's not just based on size or mass, it's based on the collision probability and mass." That being the case, if the goal is to stabilize the debris population environment in low-Earth orbit at today's levels, about five large, intact objects need to be removed per year. Many — but not all — of the potential targets in the current environment are spent Russian upper stages. Discarded rocket stages in Earth orbit are being eyed in active debris removal discussions. They are large and potentially troublesome refuse that can add to an already menacing space environment of Earth-circling clutter. As for next steps, Liou flagged the recent National Space Policy, a White House document released in June 2010. That policy, for one, calls upon NASA and the U.S. Department of Defense to pursue research and development of technologies and techniques to mitigate and remove debris in orbit now, reduce hazards and increase understanding of the current and future debris environment. What's needed now, Liou said, is an implementation plan or a road map. This long-term plan would engage international partners regarding orbital debris removal. "International collaboration will be the key," Liou concluded. "We all need to work together to move forward." Leonard David has been reporting on the space industry for more than five decades. He is a winner of this year's National Space Club Press Award and a past editor-in-chief of the National Space Society's Ad Astra and Space World.